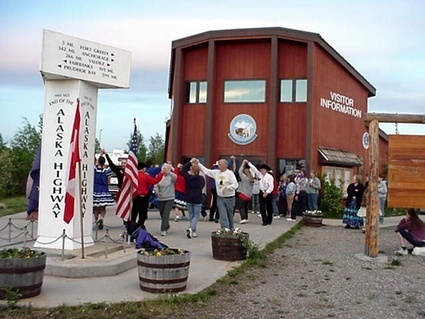 Make the Delta Junction Visitor Information Center your first stop in Delta Junction. This unique Visitors Center is located at the end of the Alaska Highway where it meets with the Richardson Highway. The Visitors Center has free brochures describing area businesses and attractions and our friendly, well trained staff are eager to answer any questions you might have. They will help you with accommodations and services in our community and offer suggestions for neighboring communities. We stock free travel guides and brochures for other areas of the state as well. Pick up a Delta Wind, the local newspaper, and check on current events and happenings in our town. 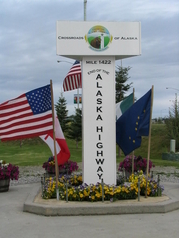 Have your picture taken by the monument in front of the Visitors Center that marks the end of the Alaska Highway. Come face-to-face with a Delta bison (mounted) and see just how large they really are. Many other mounted animals adorn the walls of the Visitors Center as well as a display of sample furs to touch. Travelers may purchase a wide variety of souvenirs and Delta Junction pins. End of the Alaska Highway Certificates certifying that you have endured "the trials and tribulations to reach mile 1422, the End of the Alaska Highway at Delta Junction, Alaska" are available for $2.00.